Well over 300,000 people living in San Diego County are hungry, Gary McDonald, Executive Director of Feeding America, told ECM, and reported by the Center on Policy Initiatives. An estimated 800,000 people live in “food insecure households”—meaning they do not always know where the next meal is coming from. The San Diego Apartment Association said rents have increased for average one-bedroom apartments 21% over the past two years. Tammy Anderson, her husband, 10-year-old son, and 13-year old daughter moved into their apartment on Schoolridge Lane, in La Mesa, in June. They had to pay a double-rent deposit, so for 3 ½ months they had to scrape an extra $100 a week for rent. Her husband rides the bus everyday to Sharp Hospital in Clairmont to clean carpets and tiles. They walk 7 or 8 blocks to the nearest grocery store. He needs knee-cap replacement surgery, is in a great deal of pain, has insurance, but can’t afford the time off. They worry that disability pay won’t be enough. “When we were having to pay the double deposit and everything, it was either food or his pain medicine,” she said. Crosspointe happened to adopt their very street for food distribution, delivering healthy fruits and vegetables from Albertson’s twice a month, along with staples, to any family in need, and finding in Tammy a grateful volunteer in the process. Foreclosures rose 70% in the third quarter of this year. Many of those managing to hold onto balloon-inflated mortgages are slicing their food budget to make ends meet. “What we’re finding is that more families are homeless now than homeless men,” said McDonald, of Feeding America. I walk up to the front of the line. No one complains, because by now everyone’s place is staked; in fact, folks are jibing and joking and it starts to feel like a tailgate party for the food line. Jack, 77, digs through his belongings and offers me his coat. “I’ve had it for years. Only worn it twice.” It’s a pristine, not to mention toasty, snazzy black wool coat with satin lining that he won in a Benson & Hedges coupon promotion. “That Jack, he’s a real gentleman,” says a woman in red sweats, standing at the very front of the line. Jack tells us he quit smoking and has been a vegetarian for 11 years, proud of his 150 lbs. What do you do if they give you, say, pasta sauce with meat? I ask. “I give it to someone else who needs it,” he says. Food demand at the San Diego Food Bank skyrocketed in the second quarter of this year, up 103% in La Mesa and 69% in Spring Valley. El Cajon saw a 7% increase in an already high food distribution of over a hundred thousand pounds, whereas Campo’s 123% increase was based on a relatively low distribution. 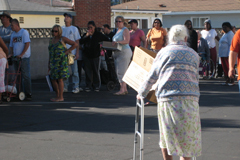 In neighboring Santee, however, the City recently closed its food bank at a senior center, over the objections of concerned advocates for the poor. “We’re seeing a lot of new faces. From every race, every background. We see them coming with kids, we see the elderly, I see people who have jobs but they need to get the foods we have to save money for other things. “I’m shocked each time with the number of people here with young kids. Because to go through a food line? It’s not a simple process. To wait there, that long, with children. And to try to carry boxes when you’ve got the strollers—probably not worth the effort unless it’s really really needed,” she said. Crosspointe also stocks a pantry for the hungry on a daily basis. Nearly 40% of San Diegans don’t earn enough money to live here, KPBS reported in September. San Diego, itself, is the 11th most expensive city in the United States. San Diego Food Bank, “San Diego County Quarterly Distribution Increase by City, January to June 2008. Percentages based on thousands of pounds delivered. “We have fixed income seniors who are really struggling,” said SDFB’s Carter. Fixed incomes don’t increase much, based on inflation, but look at soaring gas prices and food prices. A lot of seniors are highly reliant on food we provide them just to get them through the month.” Retirement accounts and nest eggs have taken a huge hit in the stock market collapse this fall. 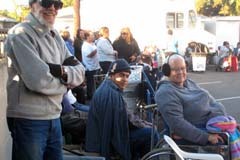 Karol Hicks, 64, from El Cajon, waits in her wheelchair. She’s excited for knee replacement surgery at UCSD on Monday. “You feeling warmer?” she asks me. Karol tells us about services from the Crisis House in El Cajon. 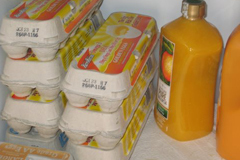 She also gets eggs, milk, yogurt, cottage cheese, and bread from the Salvation Army on Main & Anza. Another day she goes to the food distribution at Skyline. Food costs across the board rose 7.6% from September 2007 to September 2008, according to the Department of Labor and reported by the Food Research and Action Center. The price of bread went up 17.4%, cheese, 11%. Healthier, more nutritious foods like lean meats and vegetables rose a whopping 20% over the past two years. The morning sun stretches through the low-hanging branches and warms our faces. It’s almost time. An elderly woman, blind in one eye, leans against the wall behind us. “My friend offered to give me her extra walker, but I said, ‘no way!’ Long as I can get around on my own two feet I will. I just lean where I can,” she says, passing the time. This woman cares for her diabetic father, who’s had two amputations, and her mother, who has Alzheimer’s. And she’s spending her morning waiting, leaning against a wall for support, for food. Adding to the lines of hungry people: the County’s unemployment rate is at a 13-year high—6.4 per cent—and 100,000 people are looking for work, according to reports by Envision San Diego and KPBS in a new documentary, The Incredible Shrinking Middle-Class. “The type of people getting in line are different,” said McDonald, of Feeding America. “They’re people who are middle class. Or possibly even above. Who are not able to afford their mortgage and eat. Elderly people that have to decide between eating and medication. We’re finding people are calling us who have never called before. They have never in their whole life have ever needed food assistance. Jack sips coffee or tea from his thermos cup. The woman in the red sweats has a smooth, unwrinkled face, sporty short black hair, another Bluetooth earclip. She grouses about having had to wake someone up and then turns to a man wearing Bermuda shorts,“Hey! Where’s the other half of your pants!” I assume she’s a volunteer until see the #1 number card in her hand. I ask her how early she got here to be first in line. “I’d rather not say.” She does not want to give her name. She’s on disability, after working as an assistant on the neonatology ward and then custodian at UCSD Medical Center and the Burn Center for 33 years. Bad back and psoriasis in her feet so painful she could barely walk, she used to drive to a food distribution center in North Park, using only her toes, and then someone would carry her groceries to the car. 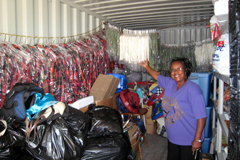 When her feet got better, she returned to volunteer there, to give something back. In a few months she turns 60, and she’ll be able to tap into her “very large tax shelter” but she’s afraid to dip into her savings. She borrowed a car to get here rather than get hers fixed. We don’t discuss the plunge in the stock market. 10:00 a.m. and the line hasn’t lessened, with a steady stream of new arrivals. Pastor Dani estimates at least 200 families came for help today. They had free diapers to give out, and a good 60-70% of the takers were grandparents getting food and bringing diapers home for grandchildren. “We have multigenerational households. Those close to retirement, or just out of it, are raising a whole new generation of people,” said the pastor. Angela Kretschmar is the sort of person for whom good things happen. All the time. She needs something, connections appear. Black hair pulled back and spilling over with curls, her warm black skin and brown eyes invite all who enter to feel welcome. And help themselves. 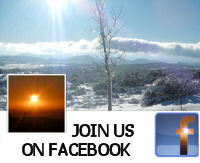 Angela is Director of Outreach for New Seasons Church in Spring Valley. 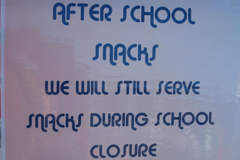 She hosts afterschool snacks as well as summer breakfast and lunch for every kid in the neighborhood who needs it. These are funded by the Child Nutrition Program. The program has twenty-six sites throughout the county and delivers over 40,000 meals and snacks each month. Angela hires local seniors through a Department of Labor community work program, who love to hand out snacks to kids at New Seasons Church. Dee says about a hundred kids come over for snacks. Once they had a book bag drive and gave away 147 backpacks. They also give the kids books to take home that the group gathers on book drives. 2:50 pm, Friday. School’s out at Bancroft Elementary, across the street. Seniors Annie Carmichael and Marge Stevenson enjoy handing snacks to kids. 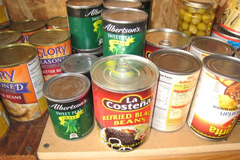 The congregation must buy the food from the San Diego Food Bank, and so far this year, that’s 340,000 pound’s worth. She’s on the wait list to be a SDFB host site, and then the food will be free, as it is at the food drop at Embassy church parking lot in Lemon Grove. 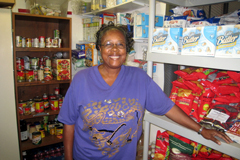 When people come to the pantry seeking food, Angela immediately prescreens them for food stamps and gets their application going. A community liaison for The San Diego Hunger Coalition, Angela tries to reach the 33% of families that are eligible for food stamps in this county and are not getting them. As of October 1, 2008, the Food Stamp Program became the Supplemental Nutrition Assistance Program (SNAP). Food stamp spending actually enhances local businesses and increases tax revenues. A dollar’s worth of food stamps generates nearly double the economic activity in the community, says the USDA. According to the Food Research Action Center and SNFB, San Diego “loses” over $144 million per year in unrealized food stamp benefits. The total for San Diego in “lost economic activity” would be $260 million annually. The number of people participating in the Food Stamp Program in July 2008 was 12 million more persons than in July 2000 across the United States. To qualify for food stamps, a family’s gross income must be below $27,000 and not have more than $2000 in bank or retirement accounts. “Right now, the hardest hit are seniors and Hispanics,” says Angela, in Spring Valley. “Hispanics are scared to sign up because they think they’re going to be deported….although all of them are legal. You know, it’s the fear. There’s a fear factor. And the seniors, they just don’t ask. “Sitting across from me, here, it’s more of a warm [place] and it doesn’t have that whole Welfare thing going on. That whole Government thing going on,” she adds. Their Church also stores strollers, high chairs, bassinettes for the East County Pregnancy Center. “While I’m giving the girls the baby items, including clothes we have, I can see if they need food. A lot of them need food also. And the food stamps. So I’m able to be one-stop shopping when they come,” Angela jokes. Angela has a knack for getting things free. Golden Share foods, a co-op that offers wholesale prices (and for whom the Church is a host site) donates extra food at to them and other regional kitchens. Starbuck’s, in Lemon Grove, gives her good coffee beans they would have discarded after 3-day’s storage. Henry’s has extra bread “and stuff,” like 120 turkeys, three or four pallets full, that the store donated to get ready for their new stock. Angela will hand out 300 free turkey dinners during her Thanksgiving “block party,” for which she expects over a thousand people to attend. She threw her first block party in May, and 1045 people arrived. They set up a “farmer’s market” with free food, clothes, and toys. “Everybody went home with something,” she says. Feeding America distributes more than one million pounds of food per month in San Diego county, donated from national corporations like Kellogg’s, Kraft, and del Monte; grocery stores such as Ralphs, Food-4-Less, and Albertson’s; and from individuals. 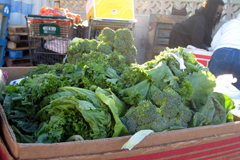 They also distribute about ¼ million pounds of produce each month, through partnership with the California Association of Food Banks and the Farm to Family Program. Other than the average 2 ½ cents per pound handling fee, the food is distributed for free to “any legitimate 501(c)(3) (an agency with federal nonprofit tax-exempt status) that is interested in feeding San Diego,” said McDonald. 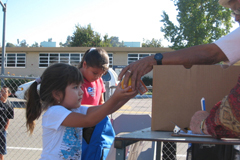 Like SDFB, Feeding America relies on volunteers and donations. Said McDonald, “About 175,000 children in San Diego County are on the free or reduced lunch program. There are 50,000 children eligible who are not getting that benefit. So 225,000 children may be in need of additional food supplies or rather qualify for the free or reduced lunch. For whatever reason they’re not accessing it. “Our Backpack Program provides food to children on Fridays when they leave school. We are distributing now to five different schools, four in El Cajon and one in Spring Valley, that’s food directly from us. So right now we’re serving about 1,500 kids in San Diego County. You can see that it’s a drop in the bucket when you look at the need.” The San Diego Food Bank has a backpack program, as well. The USDA estimates 96 billion pounds of food are wasted each year in the United States. Feeding America is in discussion with Wal-Mart to have access to their surplus foods, which are currently being thrown out, often before the “sell by” date. These foods could help thousands, if not millions across the country, who are critically hungry. Call 211 (formerly the INFO LINE of San Diego County). 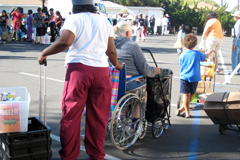 Operators will connect to a variety of services in San Diego, including the various food programs. (Some cell phones may need to dial (858) 300-1-211. Also, TTY 858-300-1311). Search online at www.211SanDiego.org. Or simply click this “Basic Needs” link, found on the site. Or click directly here for the keyword search and enter “food.” Food distribution locations, pantries, kitchens, and other resources are listed for each community in San Diego county. Feeding America: 858-452-FOOD. For more information about the BackPack Program, contact June Tanoue at (312) 641-6830. San Diego Food Bank: 1-866-350 FOOD. 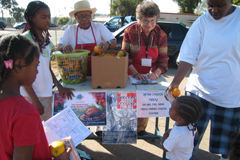 Also, click here for 211’s listing of SDFB’s community food distribution centers and programs. The Child Nutrition Program is sponsored by the nonprofit Coalition of Neighborhood Councils. Contact Diane Moss or Tanissha Harrell at (619) 546-8543.